give us a call at 1-800-626-6936. Kid Vinyl Flooring is a cushioned vinyl that allows children to play with their toys. Mannington Vinyl Flooring offers the most versatile flooring options to fit your style and budget. They study home décor, fashion trends, color forecasts. but most importantly, we listen to our customer. Your life, your style, your taste. Armstrong Vinyl Flooring is clearly the most versatile flooring option available. There are literally hundreds of styles and colors to choose from, and pricing options that make vinyl workable for most any budget. Beauflor Vinyl Flooring features a revolutionary technology that creates the most versatile vinyl available. Their engineered composite surface creates a slip retardant and stain resistant wear layer that is perfect for the busy home. All of their vinyl also features a sound resistant cushion to provide added durability and comfort. They are also the first and only manufacturer to use carpet technology to create a cushion from carpet for added versatility and comfort. 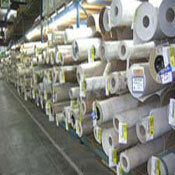 Beauflor is the only manufacturer to offer 16' 4" widths. Tarkett Vinyl Flooring offers a wide range of Sheet Flooring in order to accommodate your individual needs. Tarkett Vinyl Flooring offers intricate designs, a variety of color combinations, with a durable, no wax wear surface. Flexitec Vinyl Flooring offers vinyl flooring to coordinate with any interior design. Their extensive range of choices gives you unmatched design posibilities. Karndean Vinyl Flooring is made from an exceptionally durable from of commercial grade customized vinyl. Karndean vinyl flooring replicates all the beauty of natural hardwood with none of the practical drawbacks. 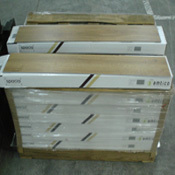 Konecto Vinyl Flooring is easy to install. The unique interlocking-edge design makes for simple installation. Simply lay overlapping Konecto Strip from one tile or plank on an adjacent tile or plank and press them together. No other adhesive is required with Konecto Vinyl Tile and Konecto Vinyl Plank Flooring! Amtico Vinyl Flooring is available in over 100 products to make your floor unique. Amtico Vinyl Flooring is made for some residential and all commercial settings. 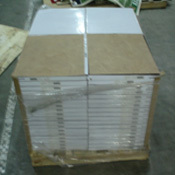 Zaxxon Vinyl Flooring is easily installed and is an excellent environmentally friendly product. Zaxxon is a great product for kitchens, offices, businesses, and any other residential or commercial application. K-Tech Vinyl Flooring combines high durability, style, and affordability in one convenient vinyl flooring. K-Tech Vinyl has been specifically designed to meet the tenuous and demanding environment of kitchen use so it looks great while being efficient and stain-resistant. Azrock Vinyl Flooring is a great choice for any commercial setting because of its wear resistance, durability, and many products to choose from. Azrock Commercial is available in over 48 colors and 4 different collections to choose from. Stainmaster Vinyl Flooring brings you all the qualities that you have come to expect from their carpet and applies them to your vinyl flooring. Stainmaster Vinyl Flooring is durable, easy to clean and has a wide variety of styles to accent your home. Nacfo Luxury Vinyl Flooring offers a large number of products in order to make you the designer of your home. Nafco vinyl is coated with Tritonite Protectant, so it will last for many years in any application. Earthwerks Luxury Vinyl Flooring offers a huge selection of products that are all based on natural occurances, like mountains. All Earthwerks products are made to last many years in any residential or commercial setting. Metroflor Vinyl Flooring is committed to bringing you the latest trends in flooring with functionality. Metroflor's vinyl flooring is known for its great appreciation for style, design and color. Metroflor vinyl flooring is designed to fit your budget. Metroflor floors never sacrifice performance and quality and are built to last and perform for today's demanding lifestyles. Burke Luxury Vinyl Tiles and Vinyl Wood Planks combine the two most desirable attributes a floor can exhibit – beauty and durability – to give you a floor that’s incredibly long-lasting and attractive. Burke Luxury Vinyl Flooring is manufactured to include new germ killing technology designed to make your facility safer from bacteria such as staph and E.coli, viruses like rhinovirus and molds. Johnsonite Luxury Vinyl Flooring is custom designed to bring style, functionality, and durability to residential and commercial applications.